Who’s your nursing superhero? That’s what we asked you. Nominate a truly exceptional nurse: one who worked hard to get where they are now, and does an amazing job. Some of you recommended a close colleague, a mentor, or someone you’re proud of having hired, a long time ago, who grew to be an expert in her field. We will tell some of those stories here on this blog. Growing up, she had a hard life. Her mother suffered from mental illness and both her parents were intense alcoholics. She got placed with relatives when she was only ten years old — hoping, praying, that this would be a better home. But the hard reality was that she had left a home of neglect only to go to a home filled with abuse, neglect, and fear. Her aunt and uncle were supposed to love her, were supposed to protect her. Instead, she got beaten and lived in filth, subjected to all kinds of abuse. Why did her parents not do the right thing? Why did they allow her to be placed with these monsters? When she was in ninth grade she was placed in a foster home, where she lived until she graduated high school with honor roll grades. What was next? College? “Not me,” she would say to herself: “Nobody in my family ever went to college. What makes me any different?” And even though she did attempt to go anyway, she dropped out in her first semester. She just couldn’t get those voices out of her head. The voices of people she had loved and trusted, telling her she’s no good, that she won’t amount to anything. So instead of thriving in college, she found herself a young single mom of two babies. No family to help her. What would she do? There was just one thing that was certain: her children would never have to go through the things she went through. They would never go hungry, never not have clean, decent clothes, never be homeless. That’s when she decided she was going to do everything she could to keep that promise to her children. In 1999, at the age of 25, she enrolled in college. At first she was undecided on a major, but that changed when she had to take her precious little girl, just two years old, to a Shriners Hospital. Her daughter was missing milestones, and that day at Shriners her beautiful baby girl got diagnosed with cerebral palsy. She cried… hard. What was this terrible condition called cerebral palsy? Would it kill her little girl? Was it going to cause her pain? She didn’t know. As she wept, holding her little girl in her arms, a nurse came into the room. The nurse hugged them, explained the condition, and she was so caring and tender. It was at that moment that she decided: “That’s it! A nurse! That is what I want to be too. I want to help others, like this nurse has helped me today in one of the scariest moments of my life”. So she did it… as a single mom of two small children she went to college, worked full time, and got her nursing degree in 2003. When I think about who my nurse super hero is… I have to say that it’s me. This was my life story. Today, my kids are grown and have lives of their own. I’m proud to say they always had everything they needed. They never went without. Today, I’m a full time nurse in Labor and Delivery, and I love it. Nursing has changed my life. I was the first to ever go to college in my family. I earned it. And if you, too, are sometimes held back by voices telling you that you won’t make it, can’t make it, aren’t worth it – beat them back, like Kim did, and overcome! 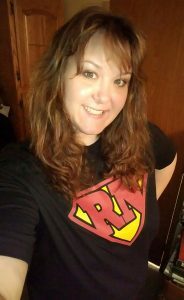 As you can see in the photo, Kim has received an “RN superhero” t-shirt from our Nurse Swag site in appreciation of her story. If you feel inspired by any of these contributions to tell us about your own “super-nurse”, don’t worry! The contest remains open. Just send your story to contest@nurserecruiter.com, and make sure to include your name, the name of your nursing superhero, the size and color the shirt should be, and the shipping address you’d like it sent to.